Building Disability-Inclusive Societies in Asia and the Pacific: Assessing Progress of the Incheon Strategypresents the first regional comprehensive progress report on participation of persons with disabilities in development opportunities at the midpoint of the implementation of the Incheon Strategy. 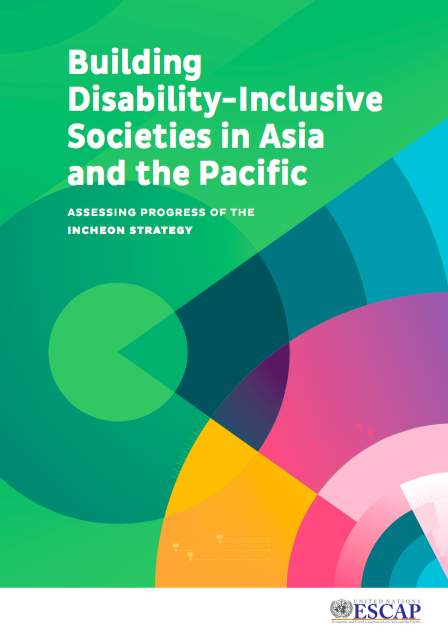 The Incheon Strategy to “Make the Right Real!” for Persons with Disabilities in Asia and the Pacific sets out 10 goals, 27 targets and 62 indicators through which the social, political and economic inclusion of persons with disabilities could be tracked. This publication provides policymakers across different ministries, as well as civil society and persons with disabilities, with the chance to reflect on the status of disability-inclusive development in the region, and set forward a path ensuring that persons with disabilities are included and empowered across all dimensions of sustainable development.